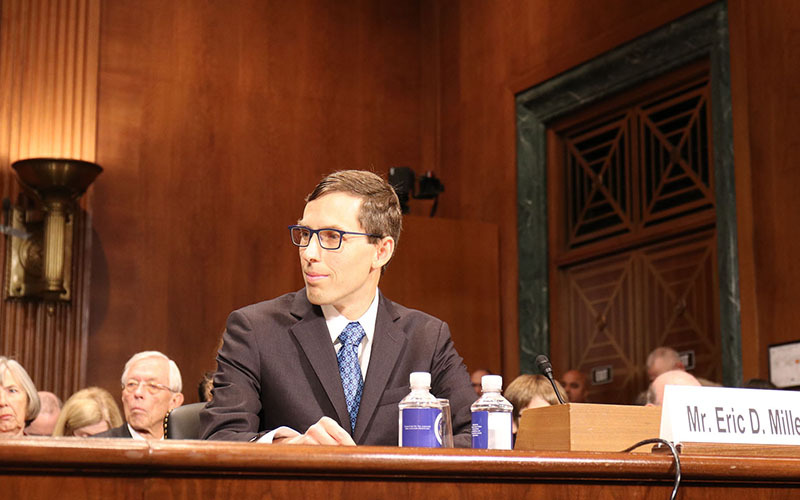 WASHINGTON – Federal appeals court nominee Eric Miller tried to dispel concerns Wednesday about his record on tribal law, telling a Senate committee that his previous work on behalf of clients did not reflect how he would rule as a judge. Miller told the Senate Judiciary Committee that while he has argued against tribes as a private attorney, he understands that tribal sovereignty “pre-exists the Constitution” and he would be impartial if confirmed to a judgeship on the 9th U.S. Circuit Court of Appeals. His previous advocacy drew opposition to his appointment from tribal groups, including the National Congress of American Indians and the Native American Rights Fund, which wrote committee leaders citing cases in which Miller was aligned with what they called anti-tribal interests. “Our concern is that (Miller) chose to build a law practice on mounting repeated challenges to tribal sovereignty, lands, religious freedom, and the core attribute of federal recognition of tribal existence,” the letter said. The hearing also drew opposition from committee Democrats, who complained that it was being rushed through while the Senate was on recess. That was evident Wednesday when only two senators – Republicans Mike Crapo of Idaho and Orrin Hatch of Utah – showed up. Hatch did not ask any questions, instead offering praise for Miller and another 9th Circuit nominee, Bridget Bade of Arizona – whose nomination was supported in a written statement from Arizona Republican Sens. Jeff Flake and Jon Kyl, neither of whom was at the hearing. Crapo prefaced his question by telling Miller he had heard concerns from tribes in his state about Miller’s record on tribal law. 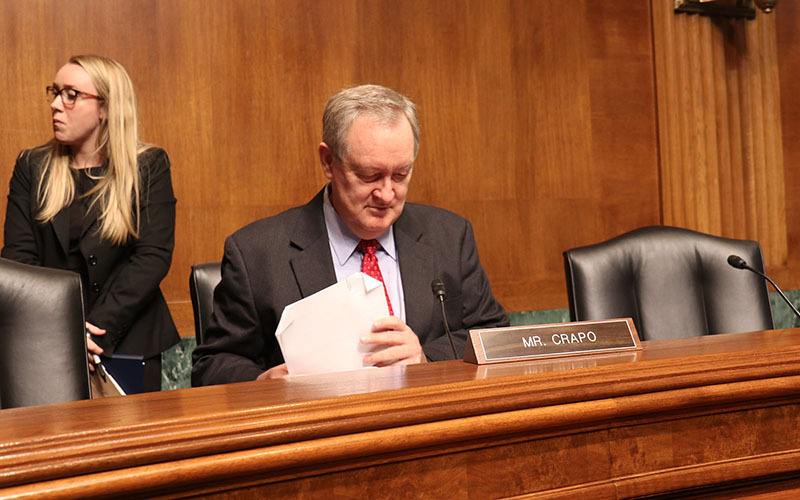 “The point is, is that there’s a belief that you don’t have the appropriate view of tribal sovereignty,” Crapo said. Miller said he is the chair of the appellate practice at Perkins Coie in Seattle, the firm where he works, and that in that role he has taken on the interests of many clients who had a legal issue which put them at odds with tribes in Washington. But he said that he understands the recognition of tribes as “an independent sovereign” and that treaties made between them and the government must be honored, expressing his regret that they have not always been honored in the country’s history. Leonard Forsman, the president of the Affiliated Tribes of Northwest Indians, said he would have to take Miller at his word, but expressed his disappointment at the sparsely attended hearing and the rushed process. Miller began his testimony by thanking his home state senators, Washington Democrats Patty Murray and Maria Cantwell – even though neither has endorsed his nomination. Under Senate tradition, judicial nominations will not move forward unless the senators from a judge’s home state give their approval by returning what is known as a “blue slip.” As of late last week, Cantwell had not returned a blue slip on Miller and Murray was defiantly refusing to do so as of Tuesday. “I am not going to be complicit in this latest rushed process to load the courts with Trump nominees in the lame duck session and I will not be returning the blue slip that signals my approval of this process,” Murray said in a statement on Tuesday.